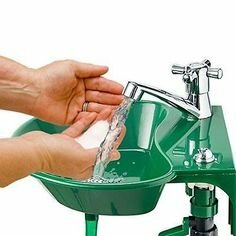 2 in 1 Outdoor Sink and Drinking Fountain Sprayer Small Garden | Fountain City Art Ctr. Keep the mess outside by washing your hands in the Outdoor 2-in-1 Water Fountain Faucet. This outdoor faucet is easy to install and makes cleaning up outdoors easy. It attaches to most garden spigots and has an adjustable water stream. Also works as a drinking fountain. Includes 2 hoses in short (26"L) and long (61-1/2"L) lengths. Sink, 11"W x 10-1/2"D x 6-1/4"H, overall. Drain hose, 35"L. Plastic and PVC. Assembly required; assembly hardware included.